Due to our frenetic and stressful lives, restoring balance represents the best way to reactivate a well-being state. Nowadays, we live with a fast-paced lifestyle and this hectic pace may lay waste to our health even more than we realize, both physically and mentally. Indeed, taking time out for yourself is beneficial to physical health as well as for mental wellbeing. In different era, ancient experts in China developed a school of thought which is based on the principle that the human body has different channels running inside it and any obstruction in this free movement could cause ailments. One of its main pillars, still in use, was that moxa, consisting of dried mugwort leaves burned on or very near the skin to induce the flow of QI – that is, according to the Traditional Chinese Medicine, the vital energy – could be used to restore the balance in the body by eliminating excesses and filling deficiencies. The intention of moxibustion is to warm and invigorate the flow of QI in the body. 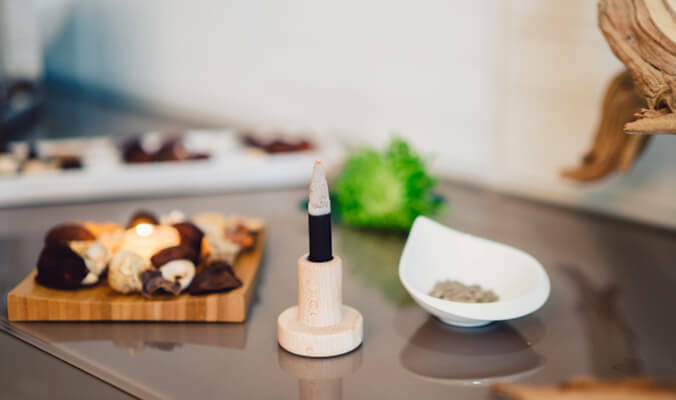 In this way, heat was used with the conviction to remove illnesses in the body; hence, the moxibustion was an ancient form of this medicine designed to reactivate the QI and promote healing by spreading heat onto the different energetic meridians. This practice has been upgraded over the years into a cigar-shaped stick of mugwort leaves. Now, experts have improved the technique and updated the treatments with new programs, in order to grant serenity and harmony, by stimulating the flow of QI through the network of meridians connecting the entire body, with the result of a well-being sensation. The heat is transmitted to the body through mugwort leaves that stimulate the acupuncture points of the bladder meridian. A regenerating moxibustion treatment is aimed at stimulating specific points on the body thanks to the heat spread by specific mugwort cigars, setting in motion the flow of QI seeing as it acts on the energy meridians. During the treatment, I personally like to ad an energetic massage to get a new feeling of vitality and a renewed excitement for life, by stimulating the acupuncture points along the kidney and gallbladder meridians. With a regenerating program, the energy recovery is obtained through three phases: revitalize the skin with exfoliating body and illuminating facial treatments, help to restore balance and vitality to the body with moxibustion and to provide energizing features with bespoke herbal teas made from goldenrod, angelica and horsetail for a remineralizing and purifying action. The impressive benefits of horsetail, Equisetum, include its ability to boost immunity, reduce inflammation, increase cognitive function, and relieve respiratory issues, while angelica is used for heartburn, intestinal gas, respiratory catarrh, nervousness, and insomnia. Lastly, the properties of goldenrod, Solidago Virgaurea, are similar to many other herbs: antifungal, diuretic, anti-inflammatory, antiseptic; however, it acts with impressive results to the kidneys, urinary track, skin, and cardiovascular system. Also Tai Chi, an ancient Chinese martial art, contributes to complete this path towards restoring balance, as it works on stability, foot and arm movements and energy release in order to enhance flexibility, balance, and agility. Among the benefits of Tai Chi, indeed, there are getting more energy and better mood, decreasing level of depression, stress, and anxiety, greater aerobic capacity and muscle strength. Lastly, practice Tai Chi also helps to lower the blood pressure and improve heart health. Moxibustion can be used for two different purposes: regenerate or detoxify. For restoring balance, an innovative work is the association of moxibustion with a detoxifying program, which unearths the meridians in order to revive the flow of energy and blood circulation by moving the mugwort stick in a circular motion over the liver and kidney meridian points. In this way, the heat is spread through indirect moxibustion- a technique that involves placing the moxa an inch above the skin’s section being treated until it turns red – all over the body, ensuring the correct flow of QI. In addition, for a more effective result, it is advisable to merge the practice with a detoxifying massage that stimulates the liver and kidney meridians internally, restoring the body’s detoxifying functions. Working from the outside in to rid body of toxins and energy blocks, this kind of treatment allows to rediscover a new sense of freedom and inner balance. To conclude, for a deeper sense of purification, there are a number of health benefits associated with dandelion tea, including its ability to detoxify the body, regulate digestion and increase bone strength, among others. The nettle, instead, helps to maintain healthy kidneys and improve digestions, while the goldenrod has a history for use with the bladder and urinary system. It is a kidney tropho-restorative that means it both nourishes and restores balance to the kidneys.